Just wanted to clarify for everyone the details about the Modal Mojo books and play-along tracks. There are two Modal Mojo products. One is called “Modal Mojo Play-along Tracks” and consists of a free 10 page PDF booklet which describes the 28 tracks. The audio tracks themselves are available on-line at locations such as I-Tune and Amazon MP3. The 28 tracks are divided into three groups, major, minor and dominant modal grooves. You can purchase each group, like you would an entire album, or you can just buy single tracks. 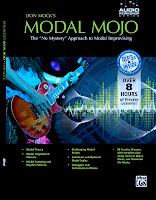 “Don Mock’s Modal Mojo” is a full-size 84 page book and audio lesson for guitarists distributed by Alfred Publishing. 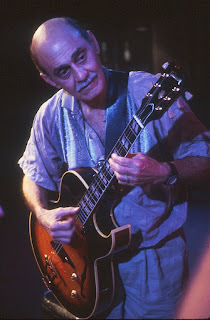 The book basically takes you through each of the 28 play-along modal grooves detailing ways to improvise over the particular groove and includes etude/demo solos for each modal type. I also spent a good deal of time on modal rhythm playing. The book comes with the same 28 modal grooves but also includes over 4 ½ hours of audio instruction. The audio comes on two disks as high-end MP3 files, one of the first instructional books by Alfred to use this format. The tracks sound great and let me just say…… I did a LOT of talking and playing on the audio CD. So if you don’t mind a few long-winded explanations and demonstrations about everything modes, I think you’ll find this to be one of the best books on the subject. For those of you who purchased my video “Jazz Rhythm Chops,” I’ve posted an improved PDF booklet of the examples in music notation and tablature. Just click on link below to download. The original tab sheets, that were included with the DVD and original VHS tape, are not very good and I would prefer that you have the new version. When we produced the video, I sent Warner Bros. my original charts, but there was not enough space for all the material to fit in the small booklet that’s placed inside the video packaging. So they decided to make a reduced tab-only version. I was very disappointed when I saw the small sheets they printed. I expected them to at least add the rhythms to the tab notation but they didn’t. We planned to add the complete booklet as a PDF on the DVD when the time came to re-duplicate new copies, but were not able to connect in time with the folks at Alfred (who had taken over the product line from Warner a few years ago). Fortunately, thanks to the internet, I’m now able to get you the booklet.